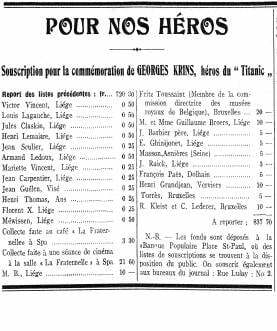 Some years ago, when I began investigations about the Belgian  born in Paris - violinist Georges Krins, I quickly found information about a memorial to be unveiled in Liege (Belgium) some months after the Titanic disaster. 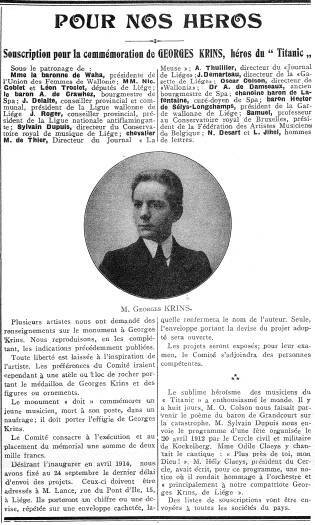 The fact that Georges Krins studied music at the 'Conservatoire Royal de Liege' is well known in Belgium but I found no traces of any Krins Monument' in Liege. 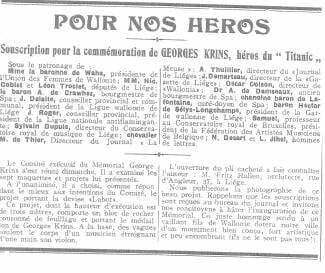 Thanks to much perseverance and the support of another Belgian Titanic enthusiast called Olivier Cesaretti, we finally found some press articles and the plan of the Georges Krins Memorial' that unfortunately was never erected! 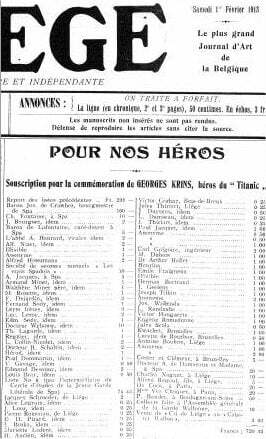 Le Cri de Liege'  an artistic newspaper  relates Georges Krins' death for the first time on 26 th October 1912 under the rubric Pour nos heros' (For our heroes). The next articles, published 23d and 30 th November 1912, expressed satisfaction that it had received encouragement. 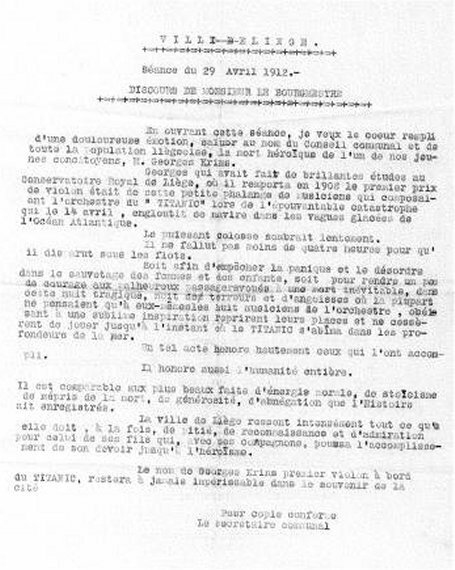 A Committee of support had been created and the Mayor of Spa  Baron J. de Crawhez - agreed to join it. It also mentioned for the first time that funding of the future memorial had been started. 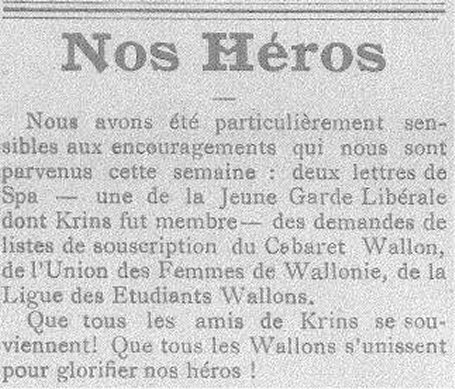 On 13th September 1913 the Cri de Liege' launched the official campaign for the Krins' Memorial. 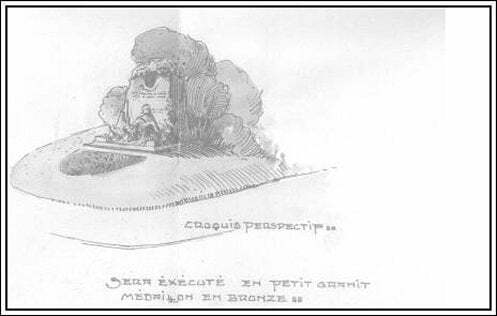 Some artists expressed their interest and they were asked to send their project before 24 th September 1913 as the Committee expressed the wish to unveil the memorial in April 1914. The Committee will give its preference to a project composed of a block of rock, a medallion, with some ornaments. 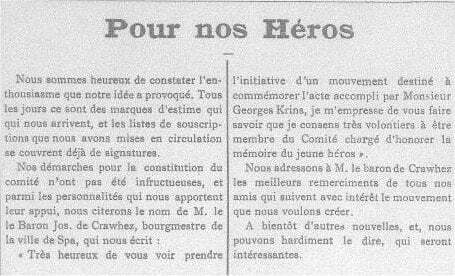 On 1st November 1913, the Cri de Liege published an article expressing the fact that the Committee had chosen one of the 7 projects in competition'. The winning project is named Labor'. 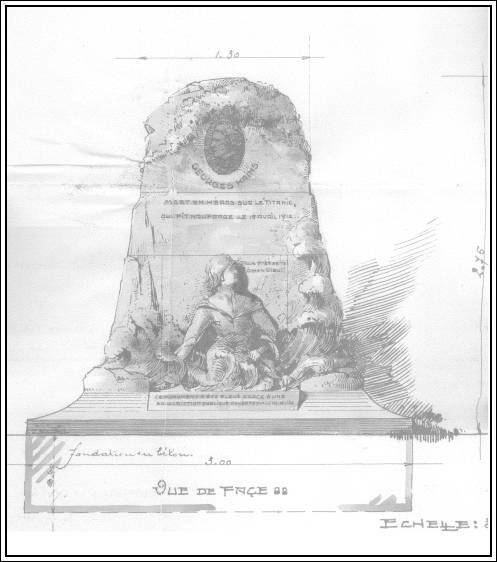 A 3 meters high block of stone, crowned with foliage and the effigy of Georges Krins. At the bottom, the waves are rolling over the body of a musician. He still has his violin in his hands. The architect Fritz Hallen, living rue d'Angleur in Liege, was awarded the project. After nearly a year of research, we finally found the original plans of the winning project. It is in the Bibliothèque des Chiroux' in Liège. 40 days later, the Belgian Army was fully mobilized and German soldiers invaded Belgium on 4 th August 1914. The Krins Memorial stayed a Ghost Memorial'! 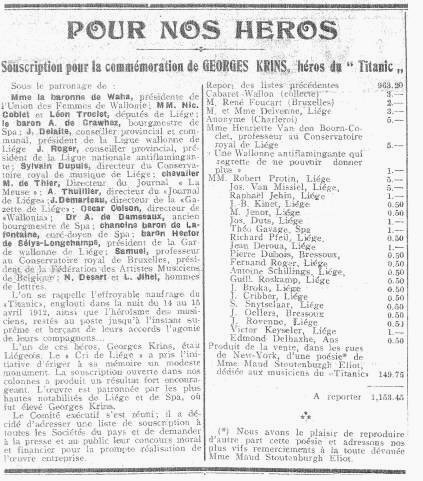 The newspaper La Meuse' published an article on 26 th September 1925 called It was a great ship, it was a little citizen of Liege  Those which one forgets'. the project capsized' for good. I would like to thank Olivier Cesaretti, Mrs. Mawez and Kathleen Neill for their help and support.